← Dialogue avec Léonora Miano au Carreau du Temple, le 22 novembre – Faire le présent #2. Lecture and discussion about « The Art of Revolt. Snowden, Assange, Manning », NYU, November 7th. 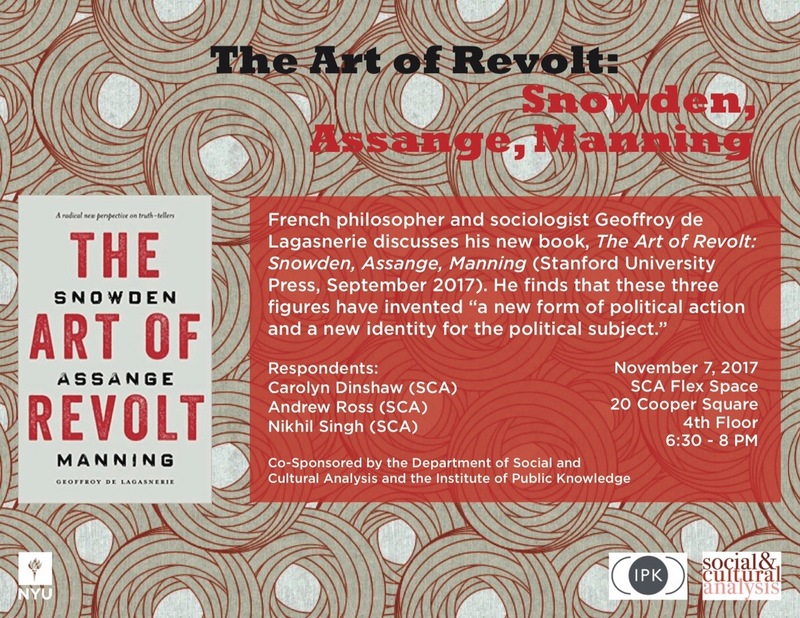 French philosopher and sociologist Geoffroy de Lagasnerie discusses his new book, The Art of Revolt: Snowden, Assange, Manning (Stanford University Press, September 2017). Co-sponsored by the Department of social and cultural analysis and by the Institute of Public Knowledge. 20 Cooper Square, 4th Floor, 6:30 pm – 8 pm. For the Facebook Page of the Event, click here. Cet article a été publié dans Lecture, Political theory, Public discussion, Uncategorized. Ajoutez ce permalien à vos favoris.